Set 'somewhere in rural England', Daniel Foxsmith's Weald transports a west London audience to a remote countryside livery, crewed by two men who care for a smattering of horses. 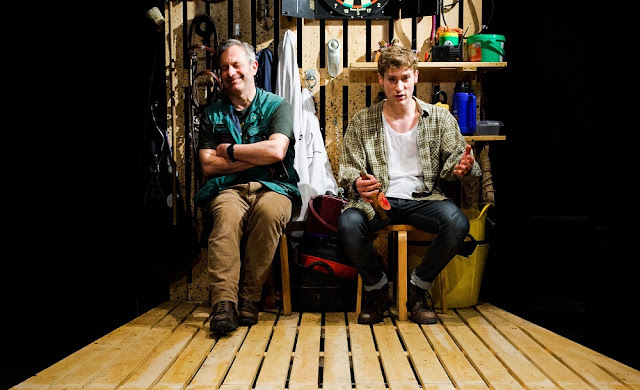 the bucolic setting quickly proves a laboratory in which to experiment with masculinity; the play prodding and poking its lab rat characters in an attempt to understand the soul of a man. The play is centered on two men: Sam (Daniel Crellin) and Jim (Dan Parr). Jim is returning from London after six years away. He presents himself as typically cocky 25 year old whose fully acclimatised to urban life. Now he needs a job. Enter Sam, owner of the yard, and so intrinsically rural that he probably shits fresh potatoes. He's in his 50s, constantly staring off at the horizon through squinted eyes as if trying to spot oncoming rain. He's clearly lugging round a bagful of regrets but here, at the livery, he's settled into a comfortable groove. Both characters have hidden depths and both gradually reveal their secrets over the course of the play. These add up to a snapshot of classical masculine paranoias: from the sexual/romantic, through financial and right through to more nebulous ideas of legacy and a place in history. Foxsmith is a careful and literate writer, carefully constructing his characters to ensure that they work as both philosophical communicators and propel the narrative. For the majority of the run-time, it's the older Sam that does much of the intellectual heavy lifting: quoting Shakespeare, Marlowe and Oliver Cromwell, giving the younger Sam lectures on the Civil War battleground their livery lies atop and attempting to impress upon him the notion that individuals should consider themselves a speck in the flow of history, or, to put it his way "you follow those who came before you". It's a seductive argument, grounded in hundreds of years of tradition and couched in the words of England's greatest literary geniuses. Yet Jim finds it wanting, summarising his position simply with "I am my own master". Their differing outlooks create friction that eventually igniting into conflict as outside events intrude. Underneath all that are the constant off-stage presence of the horses, presented as symbols of untamed, mysterious power that neither man can quite understand. They know the apparatus (shoes, feed, bridles, cleaning etc) like the back of their hands, but there's some surging spiritual power in the animals that unites the two. Weald is both a complex psychologically and philosophically complex and resolves satisfyingly (if a little predictably). Crellin and Parr give it some decent dramatic welly, folding vulnerability, bravado and mordant humour into a recognisably rural mindset. Both men do a impressive job in reacting to the subtleties in each other's performance, visibly trying their hardest to empathise with one another through a thick emotional fug. Ordinarily, this would tick all my boxes. Unfortunately for Weald, last September I saw Bea Roberts' And Then Came the Nightjars, which also explores masculinity, also takes place in a rural setting and also uses farm animals as a potent spiritual symbol. Weald suffers in comparison on almost every level, for example: Weald has an effective mise en scene, yet the wooden floor looks too fresh for an old livery and while the backdrop has a cursory splattering of mud, the costumes (except the boots) look almost new. Meanwhile, Nightjars practically manhandled its audience into a Land Rover and dropped us off in leafy Devon. Don't get me wrong, Weald is a pretty damn good play. It's smart as hell, well-staged and features two actors who obviously hold themselves to a high performance standard. But I've seen these themes, symbology and arguments done before - and better. Once you've had silk, cotton just isn't the same. 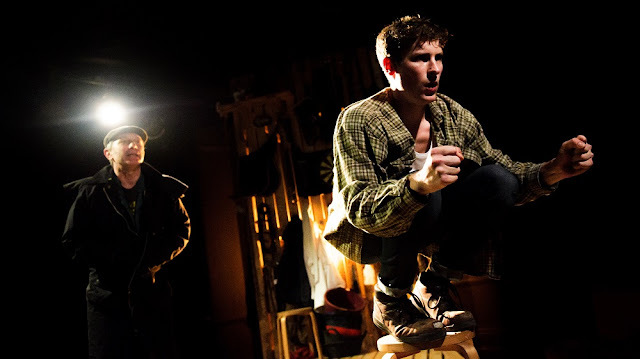 Weald is at the Finborough Theatre until 27 February. Tickets here.